Depending on the task at hand, hiring attachments can be an economical and low cost way to excavate, demolish, quarry or mine. You can hire equipment directly from us and you will have the equipment you need, when you need it. Our flexible short or long term hire options are great for those one-off projects and time-critical jobs. Using the righth attachment is not only safer, it reduces downtime, lowers operating costs and, most importantly, helps you reduce the cost per tonne of material moved. 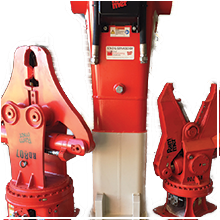 We have a complete range of purpose-built tools for your next demolition, cutting, crushing, trenching, compaction or scrap recycling project and most of our product range can be hired, with minimal hassle and simple terms and conditions. All our hire equipment is kept in excellent condition, so you know it’ll be ready to go when you need it.